The only way to dress this photo up is to put the whisky in! It all started off simply enough, “Robert Burns Night is Wednesday. Are you going to make some haggis? I think you should. Oh look, here’s a recipe.” It was at this moment I realized I am in trouble for the rest of my life. For the most part I am able to whip things up, experiment a little in the kitchen, give them to Cheryl and she’s very happy. Clearly, she appreciates it as she’s now requesting obscure offal dishes from scratch…in two days. Say it for me Scotty. My complaint of “um, I really need some extra warning so I can order and round up the ingredients” was met with a look that can be described as a cross between “say what?” and “excuse me?” How did the bar for a weeknight dinner just make a light year jump to that level? We’ve gone from soups to haggis. Nevertheless, I had been given a request and despite my grumbling I had to give it a go. After doing some searching around and not finding anything, I prepared Cheryl for the chance we may have to do it over the weekend so I could order the ingredients needed; specifically some suet, a sheep stomach, sheep live, sheep kidneys, and sheep tongue. She granted me a stay until Saturday. So off I went today to the one butcher shop I knew would be able to help: Gepperth’s Meat Market at 1964 N. Halsted Street in Lincoln Park. How did I know they would be able to help? Easy, last year for Cheryl’s birthday I roasted a suckling pig and they were able to get me a 15lb one really quickly. (Now that I look at it I really have only myself to blame after cooking one of those for her, don’t I?) I actually called weeks ahead to order the pig but they said not to worry, all they needed was a couple of days. So today, after some meetings at the office I headed down to Lincoln Park. I enter. Owner: “Hello, can I help you?” Me: “Yes, I know you can, but before I start asking for odd things, you wouldn’t happen to have any haggis would you?” Response: “As a matter of fact we do. Oh that’s right, today’s the 25th. Robbie Burns birthday. What else would you like with that order?” Music to my ears (um a half pound of that Hungarian bacon please). I explained I got this request on short notice and was supposed to be making it myself. He advised I go home, take out lots of pots and pans, and make a mess in the kitchen to show I cooked it. Ha! No need for that. Pre-cooked will work fine for our 2012 Burns Supper purposes. 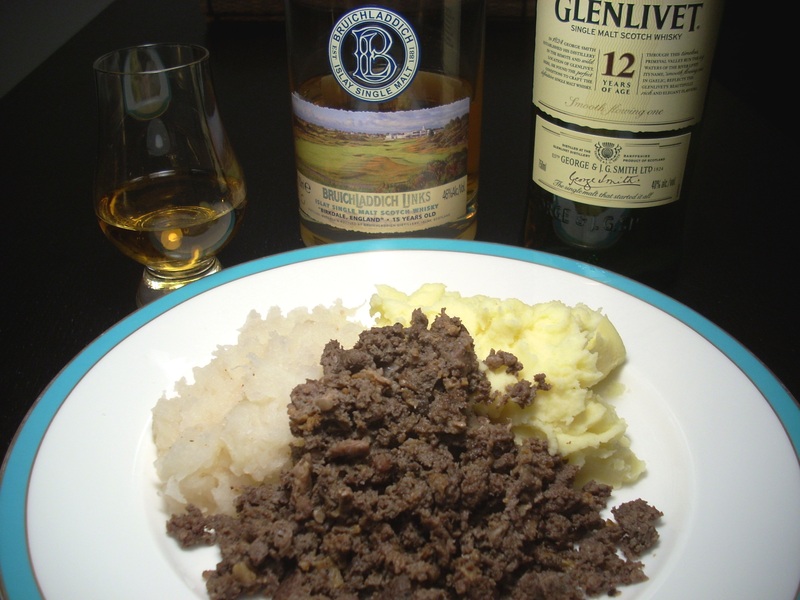 All I have to do is make the neeps and tatties, heat up the haggis, pour some single malt, and presto! One Robert Burns Supper for Cheryl. I’ll even throw in the Address to a Haggis for her. Yeah I cheated a bit, but it was handmade from a proper butcher shop (German one but hey I live in Chicago and they know their meat, especially Gepperth’s) but now that I know she really, really wants to celebrate Burns Night I’ll plan ahead next year. Of course next year she’ll probably want me to play the bagpipes too. Ok, time for some drams of whisky!